A Leicester City supporters' spokesman says manager Nigel Pearson should apologise for his row with a fan during the Foxes' 3-1 defeat by Liverpool. Supporters Club chairman Cliff Ginnetta claims Pearson's "arrogance spills over sometimes". But he believes Pearson has the backing of most fans, despite City's bad run. "He should put his hands up, admit he was out of order, apologise to the people and move on, that's all everyone wants," said Ginnetta. "We don't want to make it a big thing or play it out like a pantomime, we just want to get on with winning games. "I'm sure the majority do (still support him). People are worried and moaning, but that's football fans, you're never really happy. It's the nature of the beast. "He is popular but this arrogance spills over sometimes." Pearson admitted after the defeat by Liverpool, which kept Leicester at the bottom of the Premier League, he had been involved in a "spat" with a fan but said if they could not see his team's efforts then they should stay at home. The club is investigating the matter. A Leicester spokesman said: "We are aware of an incident that took place during Tuesday night's match and are looking into the matter to establish a full and accurate account of proceedings. "Once the facts have been determined and suitably corroborated, we will decide what next steps, if any, should be taken." 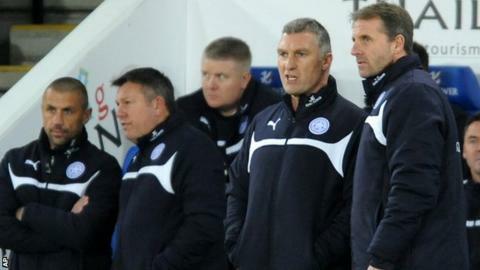 Pearson, 51, led Leicester to promotion last season but since beating Manchester United 5-3 in September, his side has taken only two points from a possible 27.